The ABC has defended Yassmin Abdel-Magied's appearance on Q&A. The ABC has refused to be pressured into severing ties with Muslim activist Yassmin Abdel-Magied after a Change.Org petition was launched calling for the media body to "condemn and fire" her following her appearance on Q&A on February 13. Abdel-Magied hosts a weekend program on the public broadcaster called Australia Wide, which explores Australia's diverse cultures. Also the founder of Youth Without Borders, Abdel-Magied's comments on Q&A were widely debated after she clashed heads with Tasmanian Senator Jacqui Lambie on issues of migration and Sharia Law. The petition, launched by right-wing news website ALTCON News, has garnered more than 21,000 supporters. It accuses Abdel-Magied of "blatantly lying" about Sharia Law and calls for the ABC to condemn her comments and fire her. 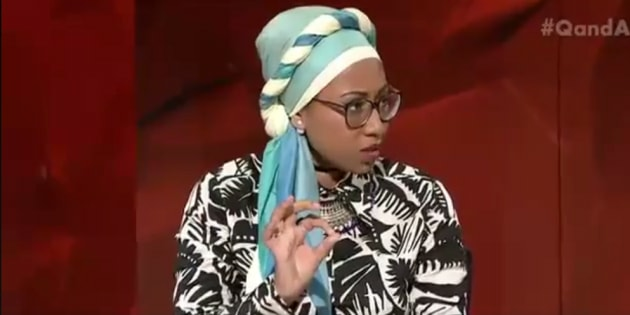 "As Yassmin Abdul-Magied made these comments on the tax payer funded QandA program, and as she is a regularly paid commentator on the tax payer funded network, the Australian Broadcasting Corporation needs to reassure the tax paying public that they condemn her rhetoric," the petition reads. In response, the ABC have stood by Abdul-Magied as a contributor to the network and defended her right to appear on Q&A and broadcast her personal views. "In addition to her ABC role, Yassmin Abdel-Magied engages in a number of other activities in her capacity as a writer, commentator and engineer. We stand by her right to appear on Q&A and share with the wider community her personal views in this capacity," an ABC spokesperson told the Huffington Post Australia. "Q&A is designed to provide a forum for opposing viewpoints to be robustly discussed and debated. Some viewpoints aired may challenge the audience some of the time, especially when controversial and emotive issues are being discussed, but Q&A never sets out to gratuitously offend." Abdel-Magied defended her Islamic faith on Q&A after Lambie called for any supporter of Sharia Law to be deported from Australia. "They're willing to completely negate any of my rights as a human being, as a woman, as a person with agency, simply because they have an idea about what my faith is about." She also said that Sharia Law instructs followers to follow the law of the land they are in, and that it was the "most feminist" of all religions. ALTCON News promotes itself as a team that prides itself on "being politically incorrect and putting forward the truth of every story," according to its website, and have previously launched a Change.Org petition calling for the Quran to be removed from sale in Australia.